European Court of Justice hears case against labeling of Israeli products from 'settlements.' Court to give ruling later this year. 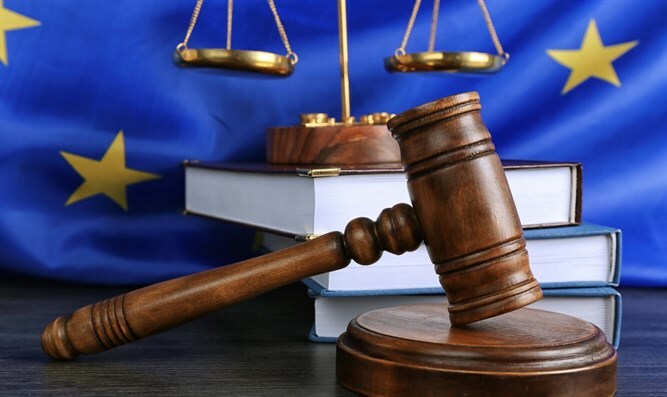 A hearing took place Tuesday at the European Court of Justice (ECJ) in a landmark case against the discriminatory labeling of Israeli products. The case was referred to the ECJ by the French Conseil d’État. It was brought by Psâgot Winery Ltd, an Israeli wine producer and exporter, together with The Lawfare Project, a U.S.-based think tank and litigation fund that files cases against anti-Semitic discrimination around the world. Psâgot and The Lawfare Project, represented by French Supreme Court law firm Cabinet Briard, challenged an opinion published by the French Minister of Economics and Finance in November 2016. The Minister's opinion stated that products from the Golan Heights or Judea and Samaria have to be labeled as coming from Israeli settlements ("colonies Israéliennes") or equivalent terms. At Tuesday's hearing, counsel for Psâgot—François-Henri Briard, Supreme Court Attorney of France—strongly argued that the insistence on applying the label of "colonies Israéliennes" goes beyond the law. The law was not designed for such political labeling but to provide fair and clear information for consumers. Polling carried out last year among French consumers revealed that they had very little interest in the politicized labeling of products. Furthermore, argued Briard, applying the law in such a way would open a "Pandora’s Box," requiring extremely complex labeling for products from over 100 different territories around the world where there are territorial disputes. The three-hour hearing was presided over by President of the European Court, Koen Lenaerts, who also heard from representatives of Sweden, Ireland, and France. These three countries' governments argued strongly in favor of discriminatory labeling, falsely implying that Israel does not exercise authority over these territories in the context of trade. The ECJ Advocate General will publish his opinion on June 14, 2019. A decision from the Court is expected a few weeks after that, which would interpret EU law on the issue for all EU member states, including France, which referred the case. As a result, the Court's decision will have landmark implications across the EU regarding the discriminatory labeling of Israeli products. "Of the hundreds of territorial disputes around the world, it is Israeli businesses alone that find themselves targeted by these unnecessary and politicized labeling requirements. The importance of the Court's decision shouldn't be understated: it will either end this double standard against Israel or legitimize it across Europe. I hope the Court grasps this opportunity to end the double standard." "I am confident that the ECJ will be very careful to keep its interpretation of EU law within a legal framework, without making foreign policy. The purpose of the EU rules is to protect health for consumers and to provide fair information on food products; they have nothing to do with political geography. The attempts of the European Commission to justify the use of the word 'colony,' using an argument based on social and ethical consumer information, goes beyond EU text and looks like an awkward legal framework; I do not think the ECJ will follow such poor and political argument."